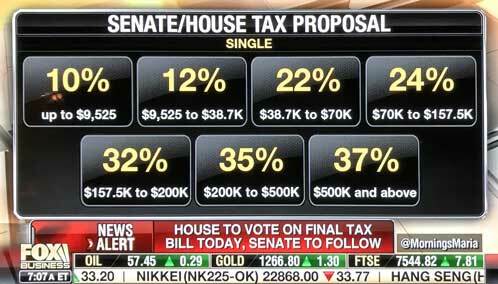 While waiting for the predicted Tuesday vote on the GOP Tax Plan that has been anticipated ALL year, it is looking like it might actually get done in 2017. It has not been easy or as simple as many of us wanted “Tax Reform,” but the corporate tax cut will make the U.S. more competitive worldwide. On the personal side, the cuts aren’t quite as clear since it all depends where one lives as to what kind of cuts will be seen. High taxed states and cities in the past have been able to deduction their local taxes on Federal returns, now this will be limited to a $10,000 cap in deductions. For the wealthier in those states who have large mortgages, there is also a cap of $750,000. For the rest of the country … average Americans who have children or take care of elderly parents, the savings will be significant. The promised simplicity is a little muddled, but it will still be better than what “most” go through today. The financial markets love that corporations can bring overseas cash back to the U.S. at a lower 15% “repatriation” rate and that these companies will have lower taxes in 2018. Economic growth is anticipated and it has yet to be seen, but most of us believe those wanting to grow business will invest capital and hire employees. Who knows … but watching the Fed inching rates up, it does look like they want to stay ahead of an economy that could heat up. If you are long in stocks today … it is probably a good day. 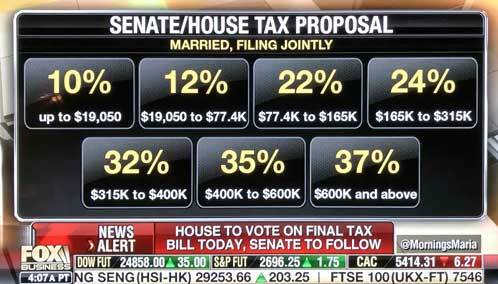 EDIT: Adding a couple of additional projected tax rate screen shots for tax rates filing single or married.